Sophie, the Black and Tan Coonhound, is funny and playful and adaptable, and loves everyone she meets. Strangers always ask how old our “puppy” is…and she is almost six years old. She loves to play, and develops great games with anyone that will participate. She has lived with a small cat her entire life, and loves her dog brother. She hasn’t lived with children, but she has met a few. She is high energy, but seems to know to be gentle with children. She is incredibly intuitive, and will know when you’re sad. She also has an amazing sense of humor. She loves to play chase, and loves toys, especially fuzzy ones and solid rubber balls. She does not get along with female dogs, and prefers to be the boss when playing with other dogs. She is a HOUND, so she stubbornly follows her nose on walks…and in the backyard…and onto the counter-top…and to your clothes and hair when you return home. She does have food allergies and will lose her fur if she eats things that disagree with her. We have found the perfect food for her, after trying dozens, so whoever adopts her will have to budget for the right dog food. Otherwise, she is perfectly healthy, spayed, and up to date on all vaccinations and flea and tick preventative. She is tall, slim 43 pounds. 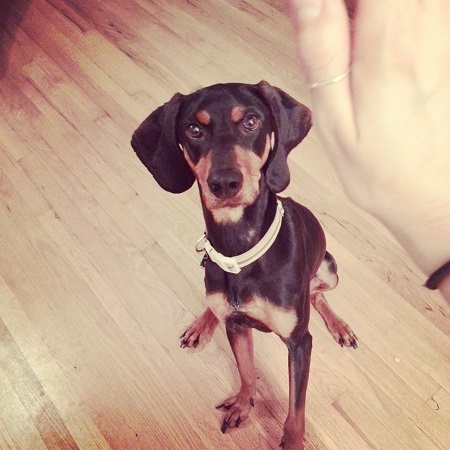 She is fully house-trained, knows basic commands and gives a flawless high five. Key points: Sophie ABSOLUTELY must go to a home without other female dogs, and she would be an ideal single dog. She needs a yard to run around and to sunbathe in (it’s her favorite thing in the entire world), and the yard must have a completely secure fence. She is an escape artist, and you must be willing to watch her when she is outside. A perfect adopter would have experience with hounds, especially the high-energy sort. Sophie can be vocal, and while she does not quite reach Beagle pitch, she has a very unique sound (think funny seal noises). Sophie will snuggle with the best of them and is happy to sleep in with you, but she must live with someone that is active. We want to find Sophie the perfect match, and are happy to wait as long as we have to to do so. She will know it, and we trust that she will make someone very happy. For more information contact Sarah at snganley@gmail.com.